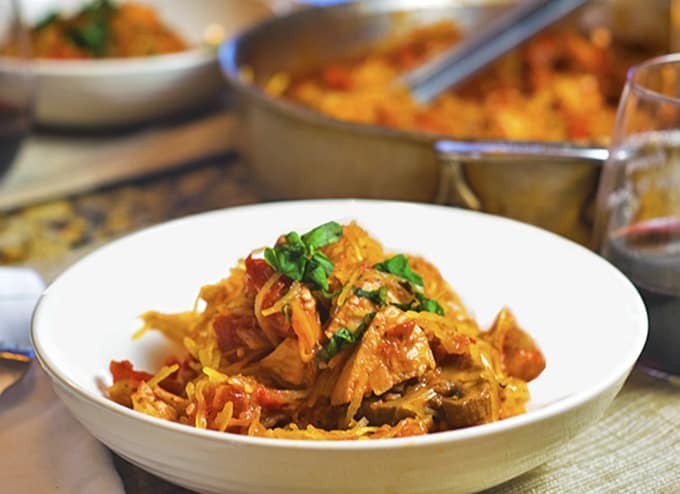 This spaghetti squash recipe with chicken cacciatore is low in fat, gluten-free, and easy to make. This healthy version of chicken cacciatore is served with roasted spaghetti squash. I remember when I was growing up, there was a commercial on TV where they secretly replaced a restaurant’s coffee with an instant coffee, and then they would watch the reaction of the people drinking the coffee. Well, I took that commercial as my inspiration and replaced a spaghetti pasta with spaghetti squash. I watched my family’s reaction, and it was a winner. This recipe was super simple to put together. It started by a quick shop of my pantry and refrigerator. I already had my chicken precooked. I try to make them ahead and use them during the week. 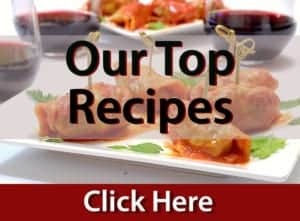 This makes cooking during the week so much easier. After I had my spaghetti squash in the oven, I opened a bottle of wine, poured myself a glass and went to work assembling this healthy meal. The sauce comes together very quickly with ingredients that we had in our kitchen. It is amazing how a healthy meal doesn’t have to be difficult to make. Once the spaghetti squash was cooked and the sauce was simmering, I added the squash to the sauce and allowed it to cook for a few extra minutes. I did this so that the spaghetti squash could absorb the flavors of my homemade sauce. It was very difficult just not to jump in and eat it right away. Thank goodness that I had my glass of wine, it gave me a bit of patience while I was waiting. When all was said and done, no one in the family even missed that they weren’t eating real spaghetti. We felt so good that we ate healthy that we splurged and had ice cream for dessert. Enjoy! This healthy chicken cacciatore recipe uses roasted spaghetti squash instead of traditional pasta. Pre-heat oven to 350 degrees. Drizzle a tablespoon of olive oil over the chicken breast and salt and pepper to season. Place in oven to cook for 30-40 minutes or until cooked. Set aside. Cut squash crosswise in the center. Using a spoon, clean out the seeds from the center of the squash. Drizzle a 1/2 of a tablespoon of olive oil inside each of the halves of squash. Lightly salt and pepper each half. Place on cookie sheet with cut side down. Cook for approximately 30-40 minutes at 350 degrees. Remove from oven and allow to cool slightly. Using a fork scrape the inside of the squash, this will resemble spaghetti noodles. Set aside. In a sauce pan heat 2 tablespoons of olive oil over medium heat. Saute onion and cook for 2 minutes or until onion starts to soften. stirring occasionally. Add garlic and cook for one minute. Add wine and allow to cook for an additional minute. Add tomatoes, chicken, mushrooms, roasted red pepper, Italian seasoning, fresh basil, sugar and salt and pepper to taste. Bring to a low boil, stirring occasionally. Lower temperature to low and cover allowing to cook until mushrooms have softened, stirring every few minutes. Add the spaghetti squash to the sauce and cook for 3-5 minutes to allow the squash to warm and incorporate with the sauce. Serve and garnish with the chopped basil leaf that you reserved. 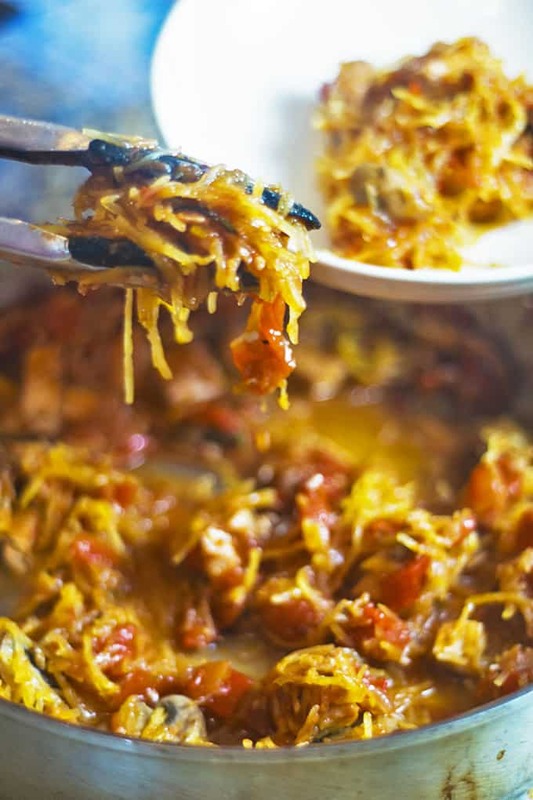 This is such a good recipe for spaghetti squash. My husband doesn’t like it on its own, but will eat it paired with something saucy with a lot of flavor. This looks like it would be a total winner in our household! This is a great comfort food classic with a healthy twist! Chicken cacciatore is such a soul warming dish. I love that the butternut squash is an equal star to the chicken. Can’t wait to make this for the family! 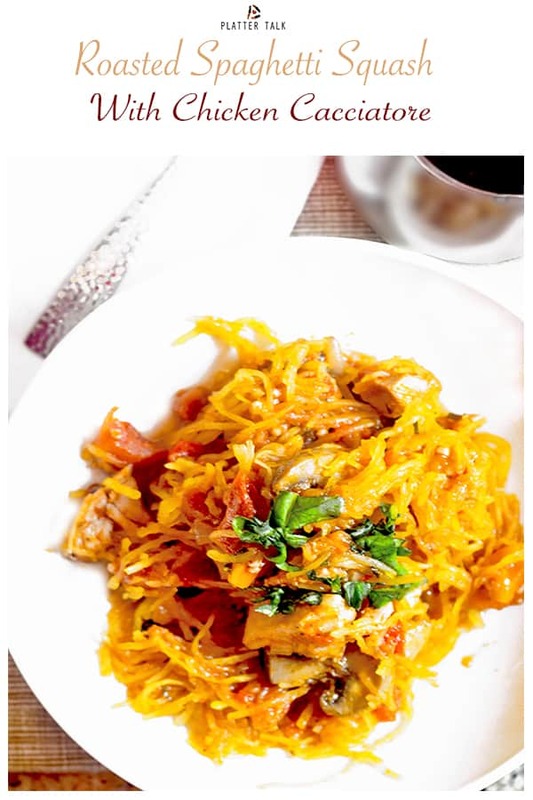 Love the creative use of the spaghetti squash here! Mixing a classic dish with new ingredients,…but it totally works! I need to try this myself! We like to precook our chicken too. This looks great! Saving this for late summer when squash, tomatoes and basil are abundant! 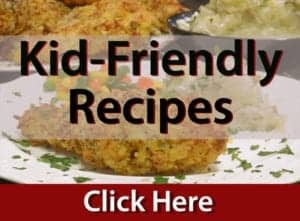 What a healthy and tasty recipe to make! Love the colors and all the ingredients you add here, and how flavorful it is. Yum! 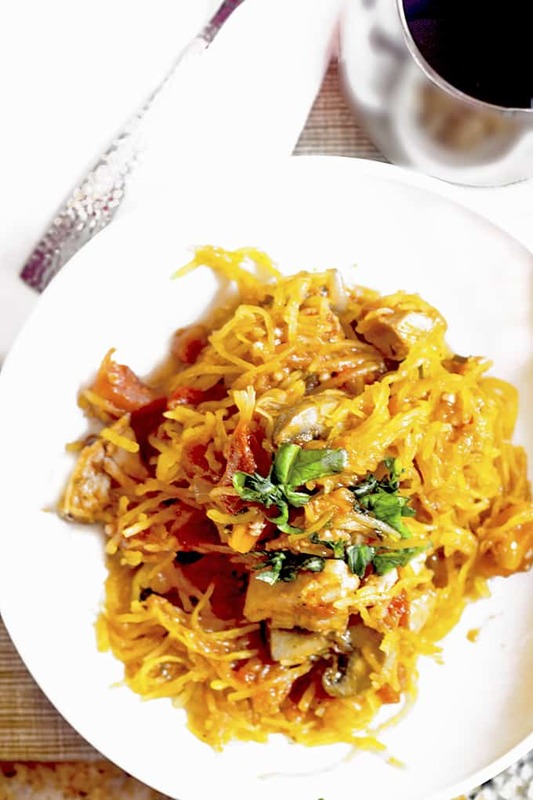 Isn’t spaghetti squash amazing? My husband was reluctant to try it, but once he did, he fell in love. I didn’t have a spaghetti squash with chicken cacciatore in my culinary arsenal, but this one is amazing. I love how easy it is to prepare. My favorite part is that, as you pointed out, this is so healthy we can have dessert. I have been trying to cut the carbs so this sounds like a great weeknight dinner. Especially with the glass of red wine! 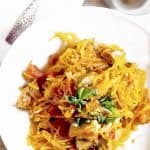 Spaghetti squash is a great substitute if you can’t have or want to take a break from the “real deal”. It looks delicious and certainly healthy and nutritious. I can’t even remember the last time I had chicken cacciatore. Pairing it with spaghetti squash (the most fun squash of all) it great. It really lightens up the meal. 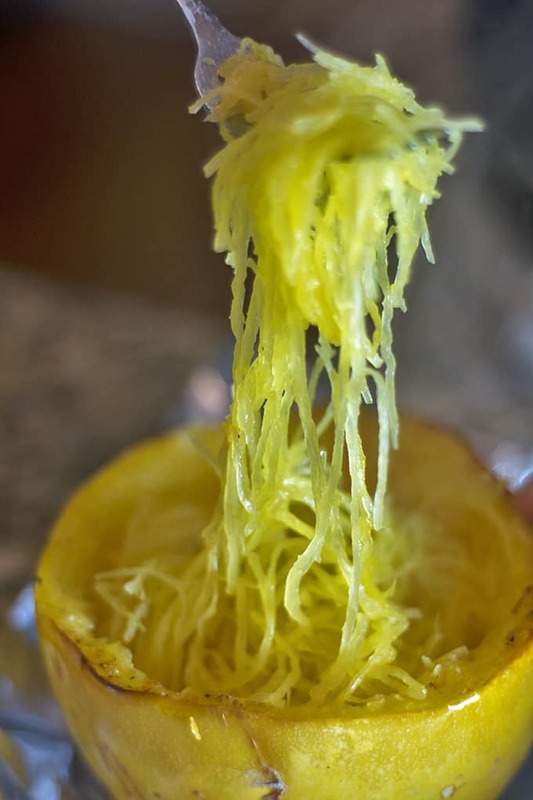 Spaghetti squash is fun! Thanks for the nice comments, Gloria!